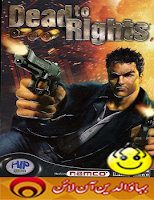 Dead to Rights plays differently from Max Payne--and from most other action games, for that matter. 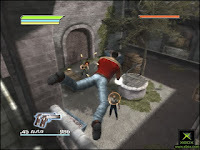 Most of the game consists of third-person action sequences in which Slate has to gun down countless foes before reaching his next objective. Just as the plot in Dead to Rights offers up a few surprises, so does the gameplay. Simple yet inventive minigames frequently figure into the action, as Slate will have to do all kinds of things, from disarming bombs to lifting weights to picking locks. These minigames rely on precise timing and/or button mashing, and they make for fun diversions. Also, Slate will have to fight unarmed in a number of sequences. Fortunately, he can switch to unarmed combat in the middle of a gunfight. There's a lot to say about the action in Dead to Rights because Slate is a versatile fighter. 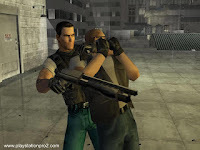 He can carry a number of different firearms at once, and the game features a wide selection of real-world pistols, shotguns, submachine guns, assault rifles, sniper rifles, and more. He'll typically salvage these from fallen foes, but he wastes no time reloading, opting instead to coolly toss aside depleted weapons. Aiming in Dead to Rights is automatic. You just press and hold the right mouse button, and Slate will draw a bead on the closest foe. Once that enemy goes down, you press the right mouse button again to find your next target. You can also opt to manually aim from a first-person perspective. This rarely figures into play, though you'll sometimes need to do so when using sniper rifles.